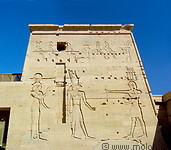 Pictures of the Philae temple near Assuan, dedicated to the Egyptian goddess Isis. 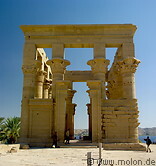 The temple has been dismantled and reassembled on the Aglika island, some 550 meters from its original location on Philae island, which was submerged when the High Dam was built. The temple dates back to 26 centuries, although most of the construction took place during the Roman period. 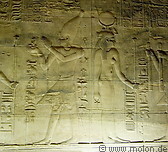 The goddess Isis was popular all over the Mediterranean and the Philae temple was its major worshipping centre.